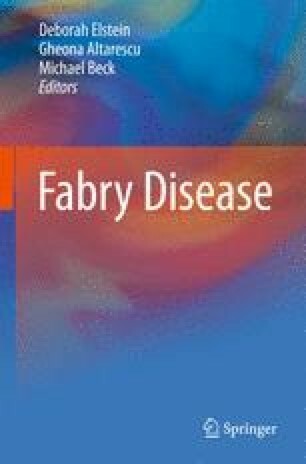 Understanding the basis for the vasculopathy associated with Fabry disease is an important challenge. The α-galactosidase A (Gla) knockout mouse has provided an important tool for the identification of experimental models that may phenocopy the human disease. Specifically, three in vivo models of vascular disease have been identified in the Gla null mouse. These models include oxidant induced thrombosis, accelerated atherogenesis, and impaired vascular reactivity. Aberrant endothelial cell function underlies the basis for these abnormalities. The characterization of these models has led to the identification of the uncoupling of endothelial nitric oxide synthase within the endothelium with the subsequent generation of reactive oxidant species as a likely mechanism underlying the vasculopathy of Fabry disease. More recent work in the exploration of the nexus between Gla deficiency and vasculopathy has followed from the establishment of an in vitro model of Fabry disease. In this chapter the development and characterization of these models is discussed and a model tying glycosphingolipid accumulation to eNOS uncoupling is proposed.